Man-of-the-moment Ricardo Santos was predictably all smiles as he savoured his best moment in his career so far. Santos claimed the first goal of his Football League career in his 64th appearance for Posh to seal a 2-1 League One win at Doncaster yesterday (March 19). Michael Smith is on top of the heap as Posh celebrate the winning goal at Doncaster. The scorer Ricardo Santos is at the bottom somewhere. Photo: Joe Dent/theposh.com. To make it even better the goal arrived in injury time at the end of the game and it was played out right in front of 1,400 travelling fans at the Keepmoat Stadium. 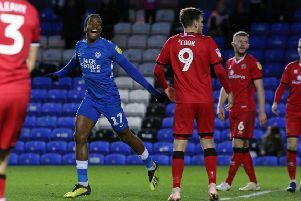 The 20-year-old defender’s goal enabled Posh to taste victory for the first time in eight League One matches and hauled them 11 points clear of the relegation zone. Santos, who started the game at right-back before switching to centre-back midway through the second-half, said: “It’s easily my best moment in football. For my first goal to be so important and to arrive so late in the game to clinch three points right in front of our fans was pretty special. “I was up for a set-piece and I could Gaby Zakuani telling me to stay up in the penalty area so I made an aggressive run and luckily the ball landed at my feet, and I managed to score. “It was a brilliant feeling, especially as I had messed up early in the game to give Doncaster a goal. I should score more goals to be honest, but I’ll settle for this one for now. “i think I showed some character to bounce back from my early mistake, but then the whole team showed the character we needed to get an important win. “The lads showed how much they care for the club. We’ve been on a bad run, but we’ve kept working hard in training for the manager and it’s good that we have given him and the fans a better Sunday than in recent weeks. Posh boss Graham Westley tipped Santos for the top after his match-winning heroics, but the young Portuguese defender is keeping his feet firmly on the ground. “I’ll take the praise,” Santos added. “But I know I have plenty of work to do on my game. “I prefer to play centre-back as there’s too much running involved at right-back, but I need to learn when to get rid of the ball earlier rather than relying on my physical strength to get me out of trouble. I also need to keep my concentration and focus better.